Chelsea midfielder Cesc Fabregas appears to have confirmed Antonio Conte will be leaving the club following reports of his sacking. It has been widely claimed by numerous sources today that Conte is set for the axe at Stamford Bridge, with the Guardian among those claiming Maurizio Sarri looks set to replace him imminently. At the time of writing there has still been no official confirmation from the club itself, but Fabregas has tweeted a goodbye message to the Italian tactician. 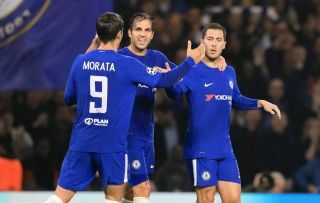 In a slightly cryptic tweet, the Spaniard also appeared to suggest life wasn’t always easy under Conte, as he had to win him over and prove him wrong after initially struggling to get into the side. Fabregas did not start the 2016/17 campaign as a regular starter but became more key in the second half of the season as the Blues won the Premier League title. It is slightly strange to bring this dispute up in a goodbye tweet, however, and it suggests that perhaps there remain some bitter feelings from the player to the boss.